The Softaculous AMPPS Team has released AMPPS 2.8. The Softaculous AMPPS Team has released AMPPS 2.7. The Softaculous AMPPS Team has released AMPPS 2.6. 1) New UI : Revamped the Modern theme making the new theme attractive, easy to use and simple. The new theme is set as default. 4) Users can now change the Admin password for WordPress from Edit Installation page in Softaculous Enduser panel. 5) Improved Script packaging API to deliver script updates faster. 6) Added Statistics : Admin can now check the statistics about the number of users, installations (scriptwise), etc from Softaculous Admin panel -> Installations -> Statistics. 7) Added option to search installations by domain from Softaculous Admin Panel -> Installations. The Softaculous AMPPS Team has released AMPPS 2.5. 3) Custom Plugins can now be added to the default script packages. Here is the guide. The Softaculous AMPPS Team has released AMPPS 2.4. 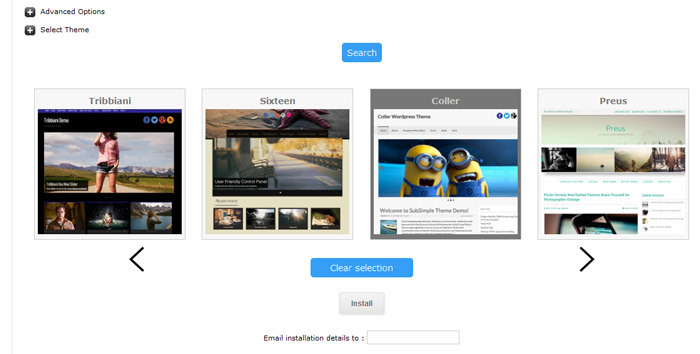 2) Users can now choose a theme to install on the script install form itself. At the moment this feature is available for WordPress. 3) MongoDB support for 32 bit architecture added. 4) PHP Mongo extension updated. 5) “Advance Settings” option removed and “Checkbox” will be selected by default for adding an entry in hosts file while adding a Domain. 6) More than 16 characters allowed for alias name. 7) Added option in the Softaculous Admin panel to list the installations sorted by domain. 8) Minor theme improvements for Softaculous Enduser panel. 9) Added option in Softaculous Admin panel to Hide the remove directory, database, database user, data directory and www directory while removing an installation. By default users can choose to remove them or not. 10) UI Improvements in Softaculous Default theme to load the scripts menu faster. 11) HeartBleed Fix : OpenSSL Libraries updated to 1.0.1g. 12) Bug Fix : When an error occurred during installation on root of the domain Softaculous failed to delete the files unzipped during the installation. This is now fixed.